Earlier this week I went to visit a few friends for a couple of days of sewing. Nothing like hanging out and sewing with great friends in a quilt shop on the days it is closed! Wendy’s shop Fabriculous is closed on Sunday and Mondays so those were the perfect days to visit. I insisted she work on something that was not on her ‘to do’ list for the shop but make something that she would really have fun with. She picked a pattern by Fibreworks called Old Blue and we had fun running around her shop picking fabrics. I helped her piece the back and cut out the blue truck on the first day. The second day she had a blast adding all the flowers to the truck. It was so much fun watching her enjoy having a shop and getting to use all those fabrics she loves. She even named it ‘Road Trip” and added the letters to the quilt. Wendy will be kitting this pattern soon if you are interested! While she was doing that I got started oh my Necessary Clutch Wallet, which is a pattern by Emmaline Bags. I chose a Tim Holtz fabric for the flap ( and fussy cut so I could get the work Highway in the middle), a brown Essex Linen for the body of the wallet and for the inside I pick two beige star print fabrics. 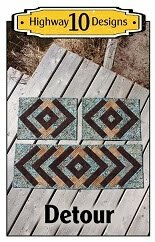 Lori got to work on a new Highway 10 Designs sample for Wendy’s shop now that she brought in 250+ bolts of batiks ( at $12.98/m). We picked some beautiful blues and a soft yellow for this Not Your Mother’s Rain Fence quilt which only took Lori the afternoon to piece! Now I’m back to work and been very busy finishing my November quilting list. Only have one more quilt to go before I take December off. I haven’t been able to take pictures of all the quilts that I have worked on this month so I do apologies to my clients for that. Just too busy trying to get them done and the weather has not been cooperating either. It has been unseasonably warm, the lake ice that started to form is melting and we have been getting a lot of freezing rain! The yard it too wet to take quilt pictures, I really hope we get more normal temperatures soon or even just some sunshine. This is Sheri’s Fancy Fox quilt and the pattern is by Elizabeth Hartman. Sheri asked for wood grain quilting which is always fun to do! I’m pretty sure this was a kit from Fabriculous as the fabrics are exactly the same as the one that my client Heather made last year. You can see that one here. I love the addition of the glasses on this quilts. She used a beautiful blue cotton backing! I used grey So Fine thread on top, a blue Bottom Line on the back, and Quilters Dream Blend batting. You may have noticed the ice is starting to form on the lake! It was –14’c last night and it looks like we will stay below freezing from now on. Just a dusting of snow on the ground so I’m hoping that stays away for a few more days while the lake freezes. Now before you tell me I spelled ‘Chris Cross’ wrong that is how they spell the name of the pattern, it is named after the designer! This is Michele’s quilt and the pattern is from a free YouTube tutorial that you can find here. I think the fabrics are Kansas Troubles and Michele requested the Maple Syrup pantograph. I used a medium green So Fine thread and Quilters Dream Blend batting. You can see the lake is still open but we won’t have too many more days like this as the lake should freeze soon! Here is our guilds second Rapid Fire Hunters Star quilt and will be a One Day Raffle fundraiser at the Cranberry Portage Christmas Craft Sale on Nov 26. Last week we raffled our Red and White Hunters Star at another local Christmas Craft Sale and sold about 350 ticket in 6 hours for $2 each. 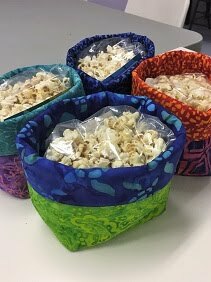 If your quilting group is in need of a good fundraiser I would highly recommend this type of raffle. When people hear it is ‘drawn today’ they are more likely to buy tickets. I used Holly Berries for the pantograph, white So Fine thread and Quilters Dream Blend batting. 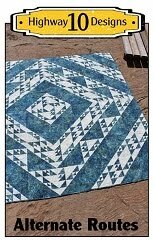 Earlier in the year Lori and I were approached by Sew Sister Quilt Shop in Toronto and asked if we would like to design a block for their Block of the Month Program called The Canadian Sampler. The quilt will celebrate Canada's Sesquicentennial next year and we were excited to have Highway 10 Designs be part of this project. 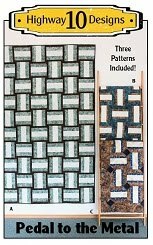 All the blocks were designed by Canadian pattern designers and information about the project is now available on Sew Sisters website here. Lori and I created the Snowflake block. It reminds me of catching snowflakes on my red knit mittens as a kid and seeing if I could find two the same, or maybe I was doing that a few weeks ago! This is Iris’s Sugar Almonds quilt and the pattern is from a tutorial on Samelia’s Mum blog here. 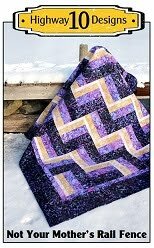 She used a purple jelly roll for the center design and white fabric strips for the background. Iris used a different method from the blog tutorial to make her quilt and I think I like how it has a more random looks. I plan on making this quilt for a fundraiser for my son’s high school grad committee using black, red and white fabrics, the school colours. It should make the perfect ‘dorm room’ sized quilt. Since it has a modern feel I used Bayside for the pantograph, white So Fine thread and Quilters Dream Blend batting. It was another calm day and beautiful sunrise this morning but the temperatures are suppose to plummet to –18’c by Thursday night so I imagine our lake will be freezing over soon! Last week I was interviewed by our local newspaper about my Nature and Northern Lights photography and the article was published on Friday. My husband came home with the newspaper today so I could read the article. They even added my picture to the cover which was very surprising but I think it was that amazing camera strap that I wear that was the reason! LOL! Here is a link to the article if you are interested in reading it. They took a few pictures from my blog and was a full page spread! I had a lot of anxiety about this article, I definitely stepped out of my comfort zone but that’s good for me right? 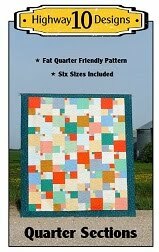 This is Evelyn’s Fresh Diamonds quilt and the patterns is available on Craftys as a free download here. Evelyn used blue and navy Batiks for the diamonds and a very light greyish beige for the background. I chose Allium for the pantograph, light beige So Fine thread and Quilters Dream Blend batting. It is a beautiful morning here, so nice to see the sun and the lake so calm. I really like this next photo with the quilt reflecting on the lake. It is nice to have a helper on the weekends to hold the quilts! The backing is a navy Fireside so this will make a very cozy couch quilt! This is Myrna’s City Slicker quilt and she used a Bali Pop for her print fabrics and a white background. I chose the Taro pantograph for this one, white So Fine thread and Quilters Dream Blend batting. This is Rae’s Scrappy Stars quilt and she used beautiful batiks from her stash to make this quilt. The pattern was from a tutorial on the Quilter Going Banana’s blog from years ago. I couldn’t find a current link that lead to the tutorial so she might have removed it, please contact her for information about the pattern, not me! I have made this quilt a few times and it is a great one to use up batik scraps. Since the blocks on this quilt are quite large I used the Fascination pantograph, beige So Fine thread and Quilters Dream Blend batting. Our snow is mostly gone and the wind has been so calm leaving the lake smooth as glass in the morning! I really hope it will freeze like this and I’ll have clear ice again for my quilt pictures. Last night we had a stunning sunset and then this morning a beautiful sunrise. This is Hollie’s Tiffany Quilt and it was a kit from Keepsake Quilting. The fabrics are Maywood Fabrics Sophia line. I picked Rhapsody for the panto as it has a fun floral design and goes well with the floral fabric prints. I used pink So Fine thread and Quilters Dream Blend batting. I had an interesting day today. I had a writer from our local newspaper stop by to do an interview about my photography. He had noticed my Northern Lights pictures on Facebook and wanted to do a profile article on my interest in photography. It was more relaxing to do this type of interview compared to video interviews as he can edit my ramblings much easier! The only down side was he wanted a picture of me and I told him one of the reasons I liked photography is it keeps me behind the camera! Oh well, I cooperated but hope it is a tiny picture! Speaking of photography I was enjoying the beautiful halo around the moon tonight. I’m really loving this new wide angle lens.